As you might have noticed on the cover photo I got rid of the acoustic diffusers behind the speakers. There is simply no need of them for the curtains are doing the main job of absorbing unwanted sound waves between the speakers. As a next step I rewired my Belden 8402 interconnect cables according to the common standard of shield grounding at one end, thus no more using the shield for transferring the signal. It turned out that such wiring yields better results – dead silent background and stress-free reproduction. The next thing I did was to optimize the speakers’ performance by introduction of softer gaskets for decoupling the drivers from the baffles and addition of sand in the pockets just below the horn mouth opening. It is simply astonishing what certain amount of sand could bring in regard of weight and volume articulation of the reproduced instruments. Separation and presence are affected tremendously, but it is the inner contrast that is the most striking thing and main contributor to the believability of the reproduction. As with so many other things the right amount of such goods is essential. When overdosed with sand for example, the guitar starts resembling piano, and its strings are no more soft but harp-like and stiff. The balance is very fragile, and it is a challenge to decide when to stop and where is the golden mean where the parts are harmonically weaved into the fabric of the whole. One thing I learned is that during critical listening for sound evaluations one should not fix all his attention on particular instrument within a given record but has to keep perspective on the overall sonic picture. What I used to do while evaluating components was to listen for pure tone and characteristic timbre of particular instrument. It is so common nowadays this kind of a mistake – to concentrate on a single instrument inside particular recording – and even well known audio reviewers suffer from it. And I’ve been making the same mistake for so long – I would adjust the piano in one record to sound realistic and in the next all is gone. One thing that helped me to overcome this kind of fallacy was the introduction to Audio Note’s system for component evaluation summarized in the essay Are You On The Road to Audio Hell. Peter Qvortrup has developed the concept of comparison by contrast in the late 1970s as a way of reducing the effect of personal preferences influencing the judgment of whether something represents an improvement or not. As Peter told me: “This has essentially guided everything we do since then.” I would even go further by saying that judging by contrast is the main weapon Audio Note has over the others. It is simply a method to compare by taking into account sonic differences. The point is that while listening one should not concentrate on the instruments themselves but on the surrounding silence, the soft echoes constituting the so called hall colorations and the recording artifacts. I formulated this process in the late 1970s when I started playing with the sound of different parts. I noticed that recordings had a different sonic character that basically must be imprinted by the equipment used to record, the room and other unique aspects specific to each recording, and when I then started to just listen for these differences I found it much easier to distinguish between better and worse equipment. I have to confess that the idea of listening for the sonic character of a record has never crossed my mind before. There are just so many audiophiles claiming that we shouldn’t concentrate on spatial clues and other sonic traits but on relevant to the musical content information like timbre, tone, rhythm, melody and so on. But especially when it comes to judging reproduction qualities that’s utterly wrong – low level details locked inside the recording process are the key element, these are hard to be rendered but easy to assess. I was quite skeptical at the beginning and I doubted that this could lead to something good. I assumed also that a case might exist where a component, in spite of its capability of underlining sonic differences between records, might still lack musicality. But then Peter made me realize that what I call “musicality” is actually not existing. What I used to describe as “non-musical” in terms of hardware was actually caused by the lack of contrast, and such terminology when used to describe sonic attributes of a record or equipment is not precise, and it should be used with the reference to the musical content only. If the equipment reveals a lack of what you call musicality then it is because the recording lack that quality, a good example of this is comparing Heifetz and Milstein playing Bloch’s Baal Shem, Heifetz is exact but lacks what I would call musicality, Milstein on the other hand, well. Peter is very pragmatic in what he is doing for more than 30 years and he gladly helped me to get free of some misconceptions I used to take for granted. Comparison by contrast is merciless, any sameness imparted by the equipment reduces contrast and thus disqualifies the equipment as inaccurate. Guided by this concept and decided to put it under test I adjusted the system in accordance with the idea of underlining the contrast in both micro and macro levels. My record collection became more saturated and the sonic differences between records increased dramatically, but also within a given record the contrast between soft and loud, near and far, low and high, light and heavy has been increased immensely. The overall result is of extremely satisfying nature and a pinnacle in my listening experience at home. 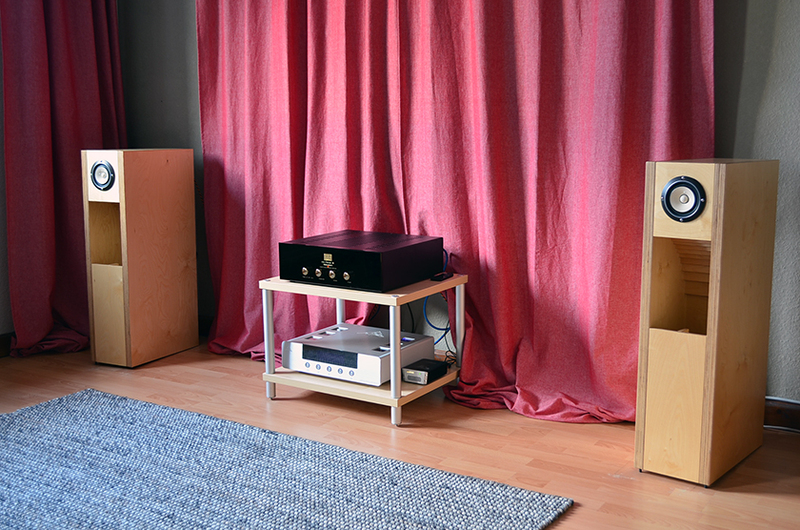 A friend of mine, musician, who was recently at my place, needed just a few minutes to conclude “What a separation!” It is actually amazing what this humble system delivers with the presence of OTO and the fine adjustments I mentioned. And this is something very rewarding, especially after these time-consuming efforts, but all I can say is it’s worth it. Now the only thing left is to enjoy music, which I really do. In this regard I could not skip to say “Thank you!” to ECM for their commitment to the sound quality and the decision to make their entire catalog available for streaming. If you wonder where to start I would suggest this album Vaghissimo Ritratto.